Some days it’s impossible to balance the day. Breakfast, naps, brushing teeth, getting dressed, snack time, play/activities, books, lunch, nap, play/activity, dinner, play/activity, baths, books, bedtime routine, over and over and over again. And when it’s so hot outside, you have to come up with indoor playtime and activities, which let’s face it, can be a real pain day after day. Yes, we’ve been to the DuPage Children’s museum, Monkey Biz, Grounds for Hope, Yorktown mall, and many other indoor play areas, but when you have 4 little ones to keep track of, it’s like running a marathon each visit. If you have children, you know that they need to run and play to burn off their energy. Lately it’s been so hot that we’ve been inside the house more than usual and the kids are starting to drive me crazy! 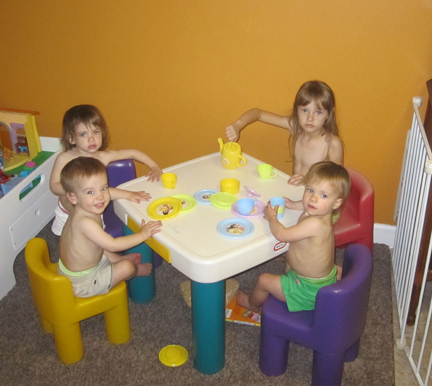 littleBee1 loves to color and paint, so she’s been doing OK, but littleBees 2, 3 & 4 are like watching a 3-ring-circus. They are all misbehaving in different areas of the house, so I’m constantly trying to confining them in one room of the house, which isn’t helping them burn off that excess energy. Lately they have started running around the house from the kitchen through the living room, around and around, and around. It drives me crazy, but I finally gave in and stopped yelling for them to stop. I mean they are burning off that excess energy and getting some exercise, and for the most part, they are pretty safe doing it. So who am I do make them stop! Of course I know allowing the kids to run around in circles drives visitors crazy. grammaBee gets so upset because she is sure that they will all trip and fall down the stairs, or crash into a chair and crack their heads open, but I get so tired of yelling when it is just part of being a kid, isn’t it? Previous post: Triplets… How do you do it? You have your hands full! Next post: Here’s the Secret to Loosing that Baby Fat!